The Gospel from Monday the second week of Advent is the gospel of the paralyzed man who is lowered through the roof. It is presented to us in Advent because, among the many prophecies about the Messiah, would be that the lame would walk. But the Gospel also helps us to focus on Jesus’ central mission for us, and it is very provocatively expressed in this Gospel. The Gospel passage contains a rather peculiar and somewhat awkward moment. Jesus looks at a paralyzed man and says to him, As for you, your sins are forgiven (Lk 5:20). What a strange thing to say to a paralyzed man. The Pharisees and scribes of course are all worked up for other reasons, but their reason is not ours, we know that Jesus has the authority to forgive sins. Let us stay focused on the strange thing to say to a paralyzed man, your sins are forgiven you. Of course Jesus is not blind or unintelligent, knows this. But looking at a paralyzed man he does not see the paralysis as his most serious problem. The man has a far more serious problem, his sin. Now most of us, who live in the world, have the world’s priorities, and we do not think like this. The Lord sees something more serious than paralysis, and we think, “What can be more serious than paralysis? !”But not as man sees, does God see. For God, the most serious problem we have is our sin. But again, we don’t think like this, and even being told we should think like this, we still don’t think like this. For most of us, influenced by the flesh, are far more devastated by the loss of our physical health, or the loss of money, or the loss of a job, or some large worldly asset, than we are by the fact that we have sin. Threaten our physical health and well-being, or one of our larger physical assets, and we’re on our knees begging God for help. Yet most human beings have far less concern for their spiritual well-being. More often than not we are not nearly so devastated by sin that can deprive us of eternal life, as we are devastated by the loss of our health or some worldly thing. Even many of us who have some sense of the spiritual life struggle with this obtuseness, and misplaced sense of priorities. Even in our so-called spiritual life, our prayers are often dominated by concerns that God will fix our health, improve or finances, get us a job, etc. It is not wrong to pray for these things, and we should. But honestly how often do we pray to be freed of our sins, do we really and earnestly pray to grow in holiness and to be prepared to see God face-to-face? Sometimes it almost sounds as if we are asking God to make this world more comfortable and we’ll just stay here forever. This attitude is an affront to the truer Gifts God is offering. And so it is that Jesus, looking at a paralyzed man, says to him, your sins are forgiven. In so doing he addresses the man’s most serious problem first. Only secondarily does he speak to the man’s paralysis, which he almost seems to have overlooked in comparison to the issue of sin. We have much to learn hear about how God sees, and what really are the most crucial issues in our life. 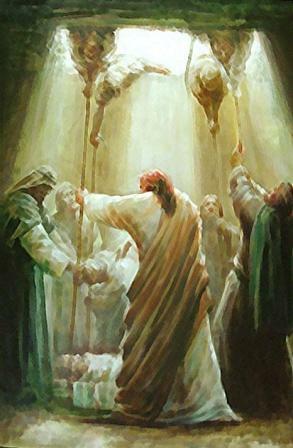 …Joseph is entrusted with a further task: “Mary will bear a son, and you shall call his name Jesus, for he will save his people from their sins” (Matthew 1:21).… On the one hand, a lofty theological task is assigned to the child, for only God can forgive sins. So this child is immediately associated with God, directly linked with God’s holy and saving power. On the other hand, though, this definition of the Messiah’s mission could appear disappointing. The prevailing expectations of salvation were primarily focused upon Israel’s concrete sufferings–on the reestablishment of the kingdom of David, on Israel’s freedom and independence, and naturally that included material prosperity for this largely impoverished people. The promise of forgiveness of sins seems both too little and too much: too much, because it trespasses upon God’s exclusive sphere; too little, because there seems to be no thought of Israel’s concrete suffering or its true need for salvation. Man is a relational being. And if his first, fundamental relationship is disturbed–his relationship with God–then nothing else can be truly in order. This is where the priority lies in Jesus’ message and ministry: before all else he wants to point man toward the essence of his malady. Yes, God sees things rather differently than we do. There is much to consider the fact that Jesus says paralyzed man your sins are forgiven you.